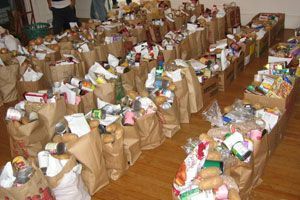 We have listed all of the East Cleveland food pantries that we have found. With help from users like you we have compiled a list of some. If you know of a food pantry that is not included here, please submit new food pantries to our database by going to the ADD A LISTING link on the header of our website. Provides a food pantry. Serves Residents of Cuyahoga County who are low-income. Documentation Required: I.D. Types accepted are: State I.D., Driver's License, library card, V. A. card. Proof of income may self declare). Pantry Hours: 2nd Saturday of every month11:00am - 2:00pmFor more information, please call. Provides a food pantry. Serves Individuals need to be low income with income being dependent upon family/household size. While preference is given to those individuals residing in East Cleveland and Forest Hills, anyone can receive service. Documentation Required: I.D. : proof of income; proof of family size. Pantry hours: 4th Friday of the month: 8am-11am.